It can be hot work having a magical time under the Florida sun. After experiencing the legendary Space Mountain and other rides, where the waiting times are often thirty minutes or more, you will want to cool off in the only place in Disney where you can: the Typhoon Lagoon and Blizzard Beach Water Parks. From water slides to lagoons, they are quite the coolest place in Disney to relax and just chill out. Since this is Disney World, the water parks have to be more of an experience than small-scale water attractions. Both Blizzard Beach and Typhoon Lagoon provide water excitement for visitors of all ages. Disney created Typhoon Lagoon to replicate the results of a Disney-style storm, including shipwrecks and surf boards blown into treetops. After the storm cleared, this water park containing nine water slides, a kids' water area, and a huge wave pool were left behind. Guests will get a kick out these fun water attractions. Ketchakiddee Creek: Little ones will delight in child-sized water fun. In fact, you may not be able to tear them away! Kids will love to play in the fountains and take a ride down water slides and rapids designed just for them. Crush 'n' Gusher: This raft coaster ride is like no other, with water jets pushing riders through a multitude of exciting twists and turns. Gang Plank Falls: Experience a four-person inner tube rapids ride that leaves everyone soaked! Humunga Kowabunga: This high-speed enclosed water slide keeps you guessing about when you'll finally hit the end, so you'll need to hang on for the big surprise finish. Bay Slides: Younger children will have great fun sliding down the gentle slopes and curves of this ride into a shallow part of the surf pool. The Bay Slide is a mini version of the Storm Slide below. 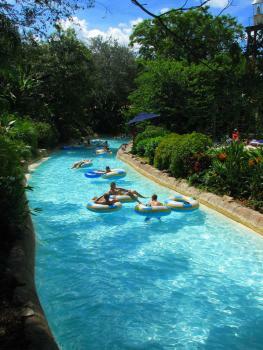 Castaway Creek: Riding on an inner tube, you can either drift or race along this creek that circles the entire park. If you choose to drift, you will have more time to take in the lush scenery along the water's edge. Keelhaul Falls: As you hold tightly to the the sides of your four-man raft, you will zoom your way through water falls and caverns, finishing at the end with a big splash. Of the three rapid rides, including May Day and Gangplank, Keelhaul is the least intense. Mayday Falls: More suitable for older kids, fast moving rapids will zoom your raft around the Mayday mountain through waterfalls and caverns. Storm Slides: These traditional water slides are fast paced, sending riders flying at 30 miles per hour through waterfalls, caves, twists and turns. Shark Reef: Guests can experience an up-close experience with sharks and tropical fish as they snorkel in this unique theme park attraction. Surf Pool: The crowning glory of any water park, the Typhoon Lagoon Surf Pool is one of the best, complete with a white sand beach. This winter wonderland is somewhat out of place in sunny Florida, but it's a welcome amusement for many Disney visitors. 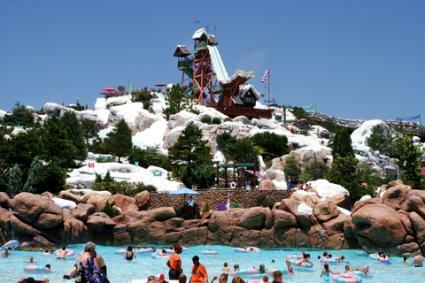 With a theme complete with powdery white snow, guests can't help but get a thrill out of this chilly water park. The following is an overview of the fun water rides offered. Tike's Peak: Young children will enjoy the slides, fountain, and wading pool set amongst the snowy scenery. Summit Plummet: This thrilling water slide gets hearts pounding when riders travel from 120 feet up to the depths below at a mind-blowing 55 miles per hour. Snow Stormers: It's like riding a wild wintry slalom when you glide down one of three downhill courses on a mat. Teamboat Springs: Claiming to be "one of the world's longest family raft rides," guests can be certain that they'll get their money's worth. Three to six people hop aboard for an unforgettable white water adventure. Slush Gusher: Mount Gushmore summons guests to take the wavy journey from the summit of this 90-foot-tall giant. Downhill Double Dipper: This inner tube ride is sure to please riders, as they race at 25 miles per hour to a wet finish. Chair Lift: As well as keeping the sun off your back, these umbrella chair lifts take you to the top of Mount Gushmore where you will get a view of such rides as Slush Gusher and Teamboat Springs. Cross Country Creek: Riding an inner tube, you will drift through polar caves and waterfalls. With seven transportation points, it is a fun way to travel to the next ride. Melt-Away Bay: At this one-acre world pool, there is plenty to do for both adults and kids. You can ride some waves on board an inner tube, relax on a sunbather, explore the rock pools, or refresh yourself under a waterfall. Runoff Rapids: Runoff Rapids has three slides. The center slides takes you down a dark tunnel into the water at the bottom. In the two outer slides, you will curl and loop around the center slide until you land with a splash in the lagoon below. Ski Patrol Training Camp: In this children's play area, kids will get to enjoy numerous obstacles including Fahrenheit Drops and Snowfalls. On the Tin Ice Training Course, they get to walk across tricky ice flows. Toboggan Racers: You will race belly first against seven other visitors down a 250-foot slope to the finish line. While Disney World's water parks include Typhoon Lagoon and Blizzard Beach, be aware that there are other water attractions in the Disney parks. Kali River Rapids at Animal Kingdom seats 12 raft passengers as they pass by geysers, battle a waterfall and zip down raging rapids in an Asian rainforest. 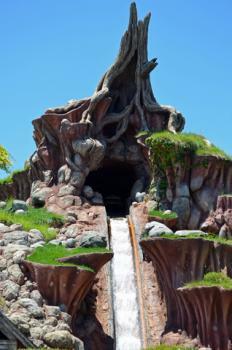 Splash Mountain at the Magic Kingdom is a classic log flume ride that you won't want to miss. Based on the film Song of the South, you will be encouraged to participate in a sing along. However, when you least expect it, you will plunge down into a pool of water. Great fun for all ages. Guests interested in visiting Disney World's water parks have a number of ticket options, depending on how many days you want to attend. Customize your "Magic Your Way" tickets with the Water Park Fun and More Option for an additional $57. Individual tickets can be purchased for each water park at $52 for adults and $44 per child. The annual pass option includes admission to both water parks. Use these GPS addresses to make your way to either water park. On their own, bar their novelty, Disney World's Water Parks offer the same basic types of attractions as other major water parks, and at a similar or higher price. Combined with the entire Disney World experience, however, they are a wonderful addition to one of the most popular theme parks in the world. After a hard week of fun in such areas as the Magic Kingdom or the Epcot Center, the more leisurely-paced atmosphere makes these water parks the ideal place to come and wind down.